At one time or the other, every home owner considers home improvement to add personality and style to their house. However, many people are reluctant to undertake home improvement since many projects require a lot of money and effort. However, there are some easy home improvement ideas which can instantly transform the look and feel of your home and that too without the need of investing a lot of money and effort. Yes, we are talking about adding designer rugs here. As compared to oriental rugs, which portray both heritage and tradition, well designed rugs are the latest development. Today, these rugs are used for many more reasons in addition to protecting the flooring of your house. People these days are using these stylish rugs for decoration purposes and to add style and beauty within a living space. 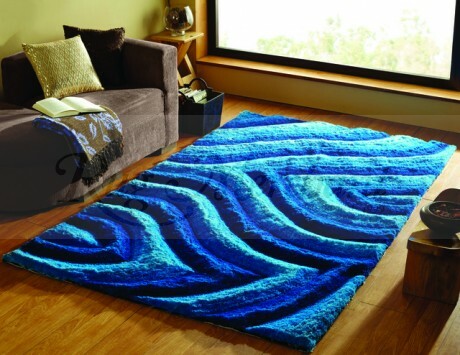 A rug is an item which can instantly transform and improve the look of your home without any effort or huge investment. If you have wood or tile flooring, the area may seem bare and blank. By simply adding a rug in the space, you can give it a more welcoming and warmer look. A classy rug design can easily add pattern and colour to a plain space. Whether you have beautiful hardwood flooring or floor designed from concrete, the area may look dull, open and large. Adding a rug to such areas can immediately add the touch of stylish pattern and bright colour. This is undoubtedly the easiest way to brighten up any dull room. Is the irritating sound from heels tapping on the floor getting unbearable for you? Rugs can be your ultimate choice. If you have beautiful flooring that you do not like to hide with wall-to-wall carpeting, adding a rug to that space will at least control the noise to some extent. The ideal way is to place rugs in the entry way, hall, or in the walking space between rooms to reduce noise to its maximum. If you want to look into more personalized reasons for adding rugs to your living space, then consider the comfort of your feet. If you like to stay bare feet in your home all day long, a soft rug can be a cushion for your feet to recuperate and rest on. A rug is a softer alternative to flooring for walking and standing and thus healthy for sore feet. Other than adding an aesthetically pleasing look to your living space, rugs can effectively protect your flooring. And when you talk about designer, stylish rugs, the elegance and quality of these rugs can keep scratches and dirt to a minimum. Adding a rug to the most crowded area of your home will protect the floor for years to come. While the trend of hard flooring persists, wide areas of hard floors can give the interior an unwelcoming and cold feeling. By strategically placing a stylish, designer rug, you can cover this up. A rug can help provide warmth, muffle noise and even define areas with beauty and style. So if you have made up your mind on getting a designer, chic rug for your living space, make sure you check all your options before opting for one. This is truly one of the most cost-effective and simple home improvement ideas to apply. Patrick Barnes has keen interest in different home improvement ideas and loves to write about home improvements that can be applied instantly and in a cost-effective manner. He has recently researched a lot on designer rugs to share his findings with his audience.